I love learning and consuming information. Maybe to a fault. 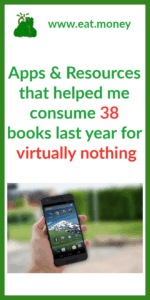 Just recently I posted on why I consumed 38 books last year and I wanted to follow that up with some resources on how to read more. If you aren’t a reader or read just here and there 38 books probably seems like a lot. You probably think I”m curled up on a couch every morning and night working my way through books. On top of that I’ve got hundreds of dollars into books every year. While I’d love to curl up with a good book I have no where near enough time to do that more than once or twice a year with what I’ve got planned for my future and 2019, specifically. Today I’m going to share some of the tools I used to consume information whether they be books, blogs, articles or podcasts. Along with that I’ll share where I find books for free or fractions of their retail cost. When I say I consumed 38 books last year this was certainly a combination of reading and listening. The break down ended up being 23 books read and 15 books listened to. If you have a desire to read more books I’d highly recommend trying to simply have your books wherever you are. Purchase a kindle from Amazon and keep it by my bedside. As I mentioned here I like to read every night before bed. Download the kindle app on your phone. This really allows me to read whenever I’m out and about. While I don’t read a lot outside of before bed, I’m into a book, I can absolutely fly through them. To follow blogs regularly I use Feedly. I use the free version and really haven’t found a need for the paid version. I follow in the neighborhood of 50 different blogs or news sources. This really acts as a one stop shop for everything I want to keep an eye on. To save articles to read at a later time I use an Pocket. I use it on my desktop and phone which is extremely convenient. The thing I love about pocket is how easy it is to save an article to it. The most popular one is audible. To me its really the gold standard for audio books because they have such a great selection, you can listen to it on mobile or desktop and it just works like you’d expect it too. I’ highly recommend checking them out. Another one I’ve ran across lately is scribd. Scribd is more than just audiobooks but I found that this was the only use I had for it. They also have magazine subscriptions and books you can read through their app. In theory that sounds good but I already have a ton of reading to do so was really only looking for audiobooks. While audible has essentially any book you’d ever want, Scribd has a much slimmer selection. During my two month free trial I was able to find a ton of books to listen to but I didn’t continue being a paying customer. The best resource I’ve found is the library. I live in a reasonably large city and our library has a tremendous amount of kindle books. Its so easy to check them out and start diving in. I’d highly recommend reaching out to your local libary. 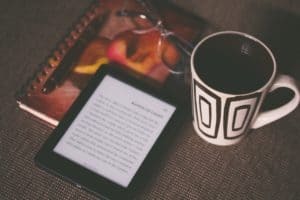 Another newer resource for me is kindle unlimited. Amazon sure does have the book game figured out. While this product costs $14.99 per month I have a three month trial going on right now. While I’m not overly thrilled with their selection I have found about 6-8 books that I’m working through right now. Amazon actually always has kindle books on sale. I’ recommend checking out this link and this one. The first has an email you can sign up for to get regular updates on deals. While I don’t find books here regularly even finding a month every month or two will go a long way. A well known resource is bookbub. They ask for your email and then send you a daily email with about a half dozen books that are between $1 and $3. Just like amazon’s email I get books every now and again but it really is worth it. The best resource is probably your library. They are free and they probably have a lot. The downside is that the app/tech side of it might be a little clunky. Push through. Its worth it. The first is sign up for the deal. A $7 audiobook is a steal. As an audible member you get discounts on other audiobooks. 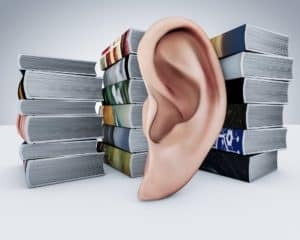 Its pretty easy to find lots of audiobooks for $5-$8. When I have become a member I’ve always purchased a few audiobooks on the cheap. While I already mentioned the app, I’d recommend Scribd here. If you have a long drive or a tedious job, Scribd may be just the resource for you. While Audible only lets you have 1 book per month, Scribd is “unlimited” but does have a limit. Over 2 months I listened to probably 6 or so books and didn’t run into any issues. For $8.99 a month its a pretty good deal. Amazon has a daily deal email you can sign up for here. Again, I find a book every now and again but they are always a few dollars. Well there you have it. What am I missing? Am I absolutely or just slightly crazy? I’d love to hear your thoughts in the comments or find me on twitter.